The two defining forces of this USAG season, Lindenwood and UIC, went head to head this weekend for the first of likely three times in 2019—and given how exciting the MIC always is, it shouldn’t have been a surprise when the two ultimately TIED, jointly registering the highest score of the USAG season with a 195.650. We had a few more ranking shifts—Air Force expectedly took the No. 5 spot back from Texas Woman’s while Seattle Pacific bumped Southern Connecticut out of No. 10 with a great senior night performance. 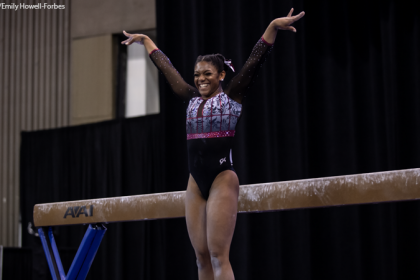 Expect more dramatic changes next week, as three USAG teams have double meet weekends, and don’t take your eyes off the race that’s shaping up between Brown and West Chester for the last qualifying spot into USAG nationals. It’s difficult to pick against Salamone’s career high and program record on bars. It’s the highest individual score of the USAG season on any event, and she has to be considered a front runner for the USAG national title. 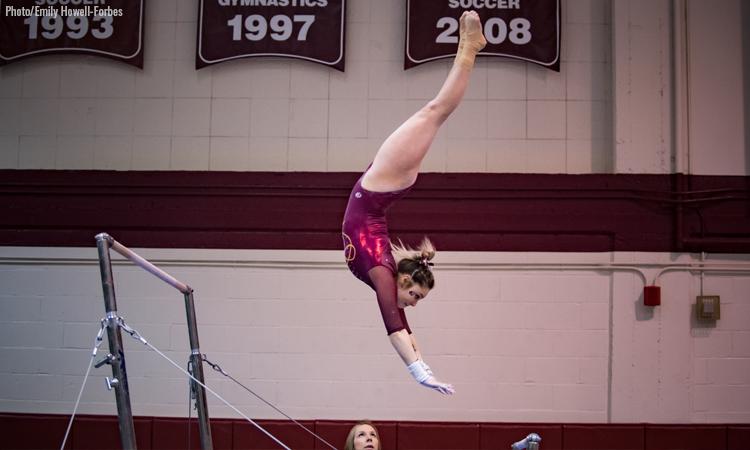 Alderman has been inconsistent on beam throughout her college career, but she’s stepped up in her senior season in a way that has been vital for a Pioneer squad that lacks depth. She’s currently the best beam gymnast on the team, and it was amazing to see her nail this routine and set a season high on her senior night. Fan favorite Jordan scored a season high 9.875 on floor at her senior night. We’ve seen her landings a little cleaner, but she’s such a visually spectacular performer, and we’re so glad that she got some recognition for her greatness in her last regular season meet in Shreveport. The Big Storyline: Cornell shined in State College, registering its third highest score in program history and once again showing its ability to push the program record it set last April. Yale scored another 194, putting pressure on the Division II teams ranked just above it in USAG and recording two top-10 all-time rotation scores. 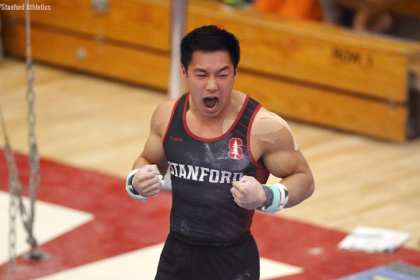 Implications: Both Yale and Cornell will retain their USAG rankings and fall two spots in the national standings. Records: Cornell’s team total was the third highest in school history. Yale recorded its fourth best beam and ninth best vault rotations ever. The Big Storyline: Brown expectedly finished on the bottom of this fascinating East Coast quad, but it won’t be upset about the very useful RQS score it picked up despite a difficult bars rotation. The Bears still have precious few team scores that don’t include counted errors, but they remain in striking range of a USAG nationals spot anyway. Implications: The Bears drop to No. 63 nationally and remain No. 9 in USAG. The Big Storyline: Air Force and Centenary met again after their dual on Friday night, and this time Air Force was in high gear. The Falcons recorded a season high while Anna Salamone’s 9.950 on bars was a personal best as well as a program record (beating her own mark from 2018). Centenary continued its great weekend by registering its best road score with the help of an all around career high from freshman Kendall Sanders. Texas Woman’s set a season high on senior day that included a career high and meet-winning 9.900 on beam from senior Erin Alderman. Implications: Air Force expectedly jumped up the rankings, dropping a catastrophic road score and taking the USAG No. 5 spot back from Texas Woman’s. It’s up to No. 52 in the country. Records: Salamone’s bars score is a program record. Controversies: Scoring was loose throughout the meet. This isn’t uncommon at Texas Woman’s, but some of the 9.9-plus scores felt generous. We’ve also heard that Air Force head coach Doug Day didn’t travel to the meet due to health issues, though we haven’t had formal confirmation from the team. If it’s true, we’re hoping for a quick and complete recovery for him. The Big Storyline: Lindenwood and UIC incredibly tied for the highest score of the USAG season in their first meeting of 2019. All around season highs from Mikailla Northern and Kayla Baddeley helped the Flames while Lindenwood’s Andavea Alexander shone on her senior day with 9.750-plus scores on all three of her events. Implications: Both teams will add several tenths to their RQS, but the gap between them will remain roughly the same. UIC drops to No. 33 in the nation and Lindenwood falls to No. 41. Records: UIC set two program records at this meet by winning eight consecutive competitions and scoring 195-plus six times in a season. Controversies: This meet ended in a tie, but Lindenwood social media had one score wrong from the very first rotation and announced the Lions the winner. The true result of the meet was uncertain until the verified score sheet was published. The Big Storyline: UIC was putting a great meet together until the third rotation when it had two falls on floor. This is the Flames’ lowest score since week two and over a full point lower than they put up on Sunday at Lindenwood. Implications: The Flames’ ranking won’t change since this score is below its RQS range. Records: UIC added to its historic win streak despite its imperfect performance. The Big Storyline: This week will be a drop score for Bridgeport: The Purple Knights had a three-fall beam disaster that led to a total that was several points below what it ought to be capable of. Losing to Towson is disappointing for Bridgeport, but it’s heading into two double meet weekends and has plenty more chances to drop its lower scores. Southern Connecticut had a similarly subpar meet that included a mess of a bars rotation and some uncharacteristic mistakes from freshman standout Hannah Stahlbrodt, who nonetheless picked up the floor title. Implications: Bridgeport will hold onto No. 3 in USAG, though Yale is creeping closer. SCSU drops to No. 11. The Big Storyline: Seattle Pacific lost to conference-mate San Jose State at home on senior night but still put up one of its best scores of the season. Freshman Kayla Chan is stepping into a leading role, scoring season highs on all three of her events. Implications: The Falcons weren’t able to make much RQS headway since they have numerous good home scores already. They won’t move in national rankings, but in USAG standings they’ll bump SCSU and move up to No. 10. Records: SPU hit 48-plus on all four events for the first time in 2019. 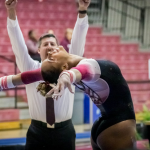 The Big Storyline: Centenary opened a spectacular weekend with a season high at home that included two event titles by Navia Jordan on her senior night. The Ladies beat Air Force on both beam and floor and recorded a season high on the latter. Air Force had a fairly weak showing—road meets hosted by Division III opponents haven’t been kind to the Falcons this year—but Anna Salamone was able to pick up her third bars title of the year. Implications: Both teams competed again later in the weekend. Implications: Bridgeport will drop to No. 48 nationally. SCSU will drop to No. 66 as well as dropping behind Seattle Pacific in USAG ranks. The Big Storyline: West Chester swept the individual titles versus Ursinus but didn’t manage to put together a team total that it can use for RQS. Implications: West Chester will drop two spots in NCAA rankings but retain its standing in USAG. The Big Storyline: The injury-plagued Redhawks continue to struggle; they’ve been unable to hit 190 this year. This was Pennsylvania’s first away contest since January 27, and though the team has put up higher totals in recent weeks, this is the Quakers’ second highest road score of the year. Implications: Pennsylvania will happily add this total to its NQS, dropping a 190.100. Records: Natalie Yang’s title-winning bars total is a career high. It’s her second in as many weeks.